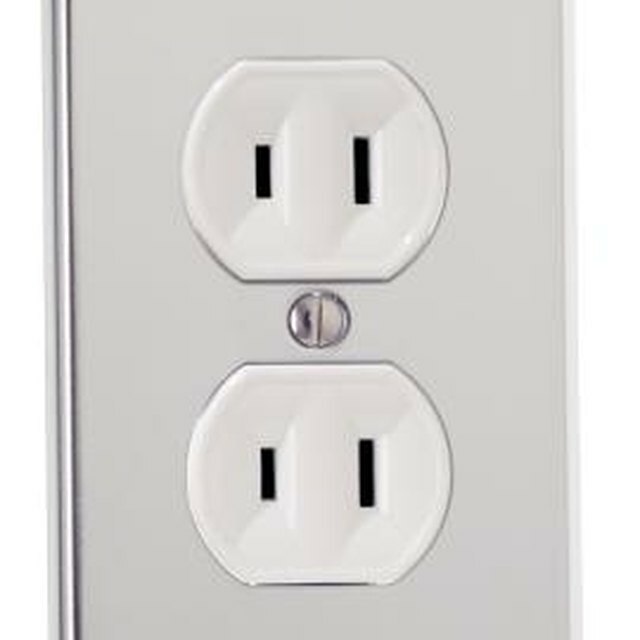 Many appliances use a 2-prong plug, which provides 110 to 120 volts to the appliance. Large appliances, such as clothes dryers, require a plug with three or four prongs, which provide 220 to 240 volts. Older appliances of this type may not require a neutral wire and therefore use a plug with only three prongs. Most new dryers and similar appliances require a neutral wire and use a plug with four prongs. You may need to install a 3-prong plug on an older appliance because of wear or damage. Strip the insulation from the last 3/4 inch of all three wires in the appliance's power cord. Twist the bare end of each wire to pack the individual strands of each wire together. Remove the two screws on the outside of the plug with a screwdriver. Remove the cover on the plug to expose the terminal screws inside. Loosen all three terminal screws with the screwdriver. Wrap the bare end of the black wire around the black terminal screw. Tighten the screw to hold the wire in place. Wrap the bare end of the green wire around the green terminal screw. Tighten the screw to hold the wire in place. Wrap the remaining wire around the remaining terminal screw. This wire and terminal screw may be red, white or blue. Tighten the screw to hold the wire in place. Place the cover back on the plug and align the holes on the cover with the holes on the plug. Place the screws into the holes and tighten them with the screwdriver. You may now put the plug into the outlet.